Genie will hold a conversation, play family videos, or event connect the user to the ‘Care Centre’ where there will be someone at the other end to talk to them. 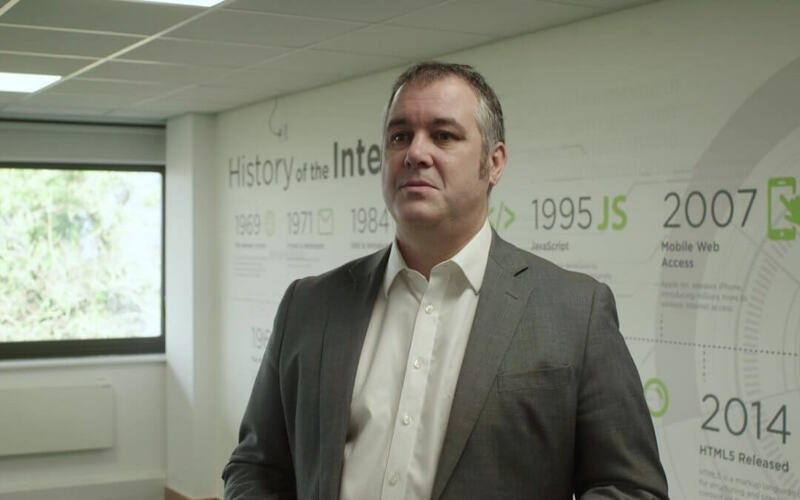 Rob talks to Business Leader about the inspiration behind the service, their move to Future Space on the UWE campus, and the challenges of being a tech start-up. We started last August and our objective is to bring robotics into the lives of ordinary people for useful purposes as a service – hence the name Service Robotics. Next year we are launching GenieConnect®, which uses a robot to enable older adults to live independently in their own homes for longer, by offering a managed service. We are not selling robots, we are not selling software – we are offering a vital service. The service itself is in its early stages as we are a start-up. However, we have been achieving some notable successes recently and have already been awarded a grant for innovation, which was a big part of our start-up plan. We have also secured funding from a primary investor, and are approaching our crowd funding campaign in December. So we have a good start for the next phase of our operation, where we will deploy a pilot service, called Genie Connect, for up to 150 users mainly in the South West. Our objective is to complete this pilot project before the end of Q1 2019 and to have these robots in people’s homes for a minimum of three months. This will help us understand what people really want, what they really need and how they react – and fine tune the service. The pilot project will result in a public launch in Q3 2019. The service itself consists of a cute companion robot called Genie. Genie is the first – but not the only – part of what we are offering. Genie is powered by an artificial intelligence engine, so it is able to hold a conversation with someone, meaning that you can chat to Genie and ask it questions. Genie will also offer you things you might be interested in, based on your profile. This creates an ‘artificial companionship’, which we hope will go some way to alleviate loneliness and increase connectivity. However, that is not all it offers, but just one of the three pillars of our solution. Behind that, and the third pillar to the solution we are offering, is a Care Centre which offers human connectivity using Genie as a terminal. Our objective is not to replace human contact with robots, so what we are doing with the Service is offering that direct person-to-person connectivity. Everything is controlled in Genie through a voice command – there are no apps or the requirement for an older adult to learn a new technology, just a simple voice command will get Genie to function. All you need to say is ‘Genie, call the service centre’ – and then a Care Centre operator will appear on-screen and you can have a conversation with them. They will know enough about you to know who you are, your circumstances, your interests and your routines. This means that you can have a relatively personal conversation with the operator who will not be targeted with how quickly they can end the conversation, but will actually engage with the user. It can also be used to connect that user with their family – his makes it easier for some who don’t feel comfortable with technology to stay connected because we can connect them through Genie. WHAT SERVICES ARE YOU LOOKING TO ADD TO THE PROJECT? In the short term we will add medication reminders and we are working on a few other add-ins. However, there is a much bigger picture. What we are doing alongside the pilot is running our own R&D projects that revolve around the Bristol Robotics Laboratory and other partners at UWE. We are talking to companies that manufacture sensors or other compatible devices. We are working with one company that has developed a ‘sniffer’ sensor. In the same way that trained dogs can smell certain compounds in the air that are linked to cancer – we are working on adding this to the Genie service, which would result in a referral to their GP. We have also spoken with a company that makes shoe insoles that monitor the changes in your gait. This is going to be really useful for detecting deterioration in ambulant capabilities, and to hopefully predict when a fall is more likely. If it can detect if you are walking differently or that you are limping, then that could also create an alert. There are also camera sensors that can monitor the minute changes in the pallour of your face, to determine blood pressure, heart rate or oxygenation levels. The sensor side of our business is running parallel to what we offer now and is planned in our roadmap for commercial launch, and will be aimed at providing a “cocoon” of wellbeing in the user’s home in conjunction with integration with Smart Home systems. WHAT HAVE BEEN YOUR MAIN CHALLENGES AS A START-UP IN TECH? The main challenge with being a start-up, is getting funding. Having said that, we have done very well. We have already received seed funding from Britbots, a specialist primary investor, and the grant applications we have made have been very well received. What we do is at an intersection of robotics, healthcare, elderly care, dementia and loneliness. We are tackling big societal issues with robotics and AI – which is why I believe we have been successful in our funding so far. WHAT WAS THE INSPIRATION BEHIND SETTING UP THE BUSINESS? About two years ago I decided to start my own business, and Robotics was a business that I had come in contact with through my career and have a strong professional interest in. Even though I am a Mechanical Engineer, I have always worked in business-orientated roles and saw an opportunity to do something meaningful to finally bring robotics into our everyday lives. Part of this was inspired by personal experience of my mum. She became, as I like to put it, involuntarily-single three years ago when my dad passed away, and was trying to adjust to her new life. She needed to get used to not having a sounding board or someone to ask questions of, and although she is very active and independent, she still feels lonely sometimes and was struggling to adjust to that massive change in life. That made me think that there has to be an application or an elegant way of using technology to the benefit of the older adult population. We hear the term ‘digital natives’ a lot – however the real natives are really analogue because our older generations haven’t grown up with iPads and the tech of today. My thinking is that we have a responsibility to make technology useful and transparent to this generation. The voice activation that is used in Genie was a manifestation of this idea. CAN YOU TELL ME ABOUT YOUR PILOT LAUNCH? We have partners in the Bristol Robotics Lab and at Future Space. BRL are going to help us design the pilot project and analyse the users – looking at what we can do to help them, because we need to verify the viability of the solution and user experience. We are working with another cyber security company at Future Space to make sure that our system is 100% secure. As mentioned before, RemindMeCare is an essential part of the pilot project. We are also working with the University of Gloucestershire on the social care and dementia research. These partners mean that we are in a position now to make a real start on this project. WHAT DO YOU MAKE OF THE GROWTH OF TECH, SUCH AS AI, IN RECENT YEARS? We’ve been talking about AI for a long time, however we are only now truly starting to use it. We are seeing AI and automation in all areas of business. Data analytics are benefiting from the development of this tech, which we were never truly doing before. The best AI engines will be the ones that have been around the longest because they have the date sets and the experience of analysing data. It’s an open market and we will pick the one that gives us the best advantages for our application. I am very excited about the future of AI and it’s use in our solution. Right now we are just focused on GenieConnect® but there might be other sectors we can look at in the future. Our funding will allow us to start hiring people. We are going to need software engineers and a new Care Centre for example. We are at two employees right now – me and my business partner – but I hope to have around ten by the end of Q1 2019 based at Future Space, which will be our office until we outgrow it. We have a facility in Berkeley as well which we use as a storage and workshop facility – but Future Space will be our HQ. WHAT ARE YOUR HOPES FOR YOUR UPCOMING CROWDFUNDING CAMPAIGN? This next round of funding will allow us to deploy the pilot project of up to 150 robots in three regions of the UK including Bristol, ahead of our commercial launch next year. This really is a chance to make a positive difference to the lives of our older adults. We’re inviting interested parties to contact us or pre-register on our website and we will let them know when the campaign is live.